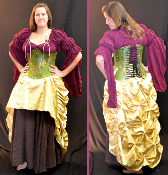 Our Bustle skirt is flounced and tucked plentifully in the back! High cut front looks nice layered or to show off your legs or bloomers. Shown here in satin Brocade fabric.